for $195,000 with 2 bedrooms and 1 full bath, 1 three quarter bath. This 1,296 square foot home was built in 2015 on a lot size of 0.08 Acre(s). 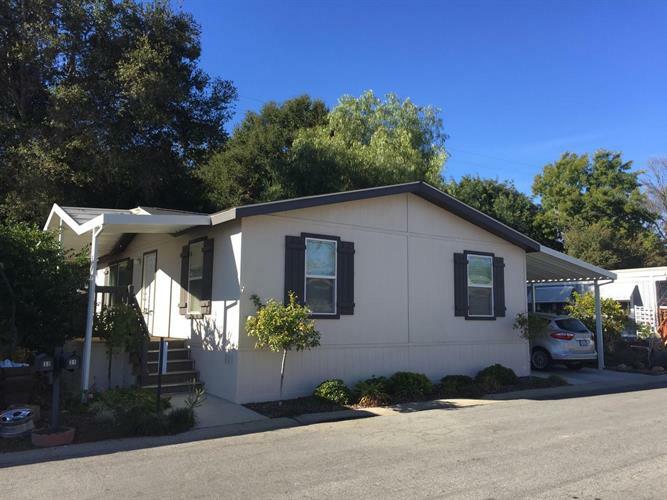 NEW PRICE + 950 Woodland Avenue #31 Ojai has so many things going for it: New in 2015, this double-wide manufactured home is tucked away on one of the Park's back streets and cuddled up against a wooded hillside. The Seller says she will miss the quiet but MOTIVATED TO SELL for a great work opportunity. You too will love how the pitched ceilings, dual pane windows, forced heat and a charming fireplace (electric) make this a comfortable and welcoming home. It's a spacious two-bedroom/2 bath with room for a 3rd bedroom or... an office/art studio? After all, the living room is over-sized! Enjoy the kitchen's newer appliances, center island, lots of storage, and formal dining area. There's a separate laundry room. Covered front porch makes for outdoor year-round living. The two space carport has a secured shed for tools, equipment, bicycles. Ojai Oaks Village is a Family Park for all ages. Space rent includes use of Clubhouse, pool and spa for the whole family. Ojai School District.